When flooding and mudslides swept through the home of rescued seals and sea lions at the Pacific Marine Mammal Center on Dec 22, 2010- things looked bleak for these adorable aquatic animals. Fortunately all of the animals were safely transferred to San Pedro, but vital imaging equipment was destroyed, surgical areas were contaminated, and supplies were damaged and lost. That's when Bob Barker donated $250,000 to replace x-ray equipment and rebuild and repair surgical areas, pumps, plumbing, and more. 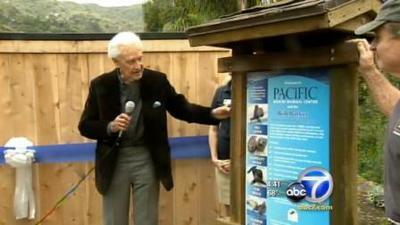 During today's event June 8th, 2011, Bob Barker was present for the release of two rehabilitated sea lions. 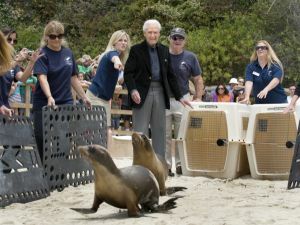 Barker (a female sea lion) and Jack (a male sea lion) were released into the wild after several months of medical rehabilitation. There are currently 32 other marine animals being rehabilitated at the Pacific Marine Mammal Center. You can come down and visit the animals daily from 10:00am - 4:00pm to see the animals and learn more about these amazing marine critters. Admission is free, but you can help support this amazing facility and the volunteers who help operate it by making donations! Join in and write your own page! It's easy to do. How? Simply click here to return to ActivitiesInvitation.